Want to brighten up your garden or conservatory with the finest rattan furniture? With a Rattan Direct Ltd. voucher you can get a whole new look for the summer season without breaking the bank. Combining durability and comfort with great style and design, rattan furniture is the perfect choice. And with Rattan Direct Ltd. voucher codes you can save money while you shop. Rattan Direct Ltd. voucher – Assortment, Products & Brands How to shop at Rattan Direct Ltd. Payment options at Rattan Direct Ltd.
Rattan Direct Ltd. is dedicated to supplying top quality rattan furniture to homes and businesses around the country. As the UK's leading rattan furniture supplier, they are committed to designing and producing the very best products on the market, offering them to customers at the best possible price. With all furniture and accessories designed in-house by the talented Rattan Direct Ltd. team, customers can be sure of getting unique and stylish furniture that can't be found anywhere else. Rattan furniture is ideal for decorating your garden, your conservatory or even for creating a light and airy feel in a main room such as a living room or dining space. All Rattan Direct Ltd.'s products are completely maintenance-free, designed to be left out on the British weather all year round – so no fighting to restore old and weathered furniture once the summer season comes round. Constructed from durable PVC rattan woven over a fully aluminium frame, they will not rust or go mouldy. And with a 5 year structural warranty and free outdoor covers, you can be sure of a product that will last and last. At Rattan Direct Ltd. you can browse a fantastic selection of outdoor furniture available in a wide range of colour schemes from black – perfect for creating a stylish contemporary look – to brown, which is ideal for coordinating with wooden decking. Choose from sofas sets, modular cube sets, bistro sets, corners sofas, dining sets and much more – or purchase individual chairs, tables and sofas to design your own furniture set to suit your individual needs.. Want something aimed at a more relaxed, lounging garden vibe? How about a rattan sunlounger or luxurious daybed complete with built in sun shade? The company also offers a wide range of garden accessories including parasols, patio heaters, storage boxes, plant pots and more. Want to get shopping with Rattan Direct Ltd.? With a Rattan Direct Ltd. voucher you can make great savings on exclusive products for your home and garden. Whether you want a whole new set of garden furniture or a new sofa for your conservatory, Rattan Direct Ltd. vouchers will help you get the look you want without spending a fortune. Facts about Rattan Direct Ltd.
Browse our website until you find a Rattan Direct Ltd. voucher that suits you, then navigate to their website to begin shopping. 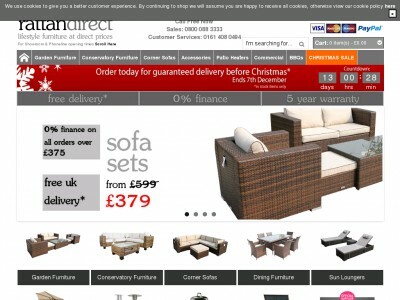 Enter your Rattan Direct Ltd. discount code in the box provided and click 'Apply discount'. Want to find out more about the fantastic products on offer from Rattan Direct Ltd.? Why not check out the company's dedicated YouTube channel? You'll find lots of exclusive content including TV spots, products overviews and more. You can also use this channel to find out more about saving money with Rattan Direct Ltd. voucher codes. If you've enjoyed shopping for furniture and more with Rattan Direct Ltd., why not continue your home makeover with great deals from B&Q and Dunelm? Or, if those aren't up your street, you'll find plenty more stores to browse in our Home and Garden section. How to shop at Rattan Direct Ltd. Enter your Rattan Direct voucher in the box provided and click 'Apply discount'. Enter your billing address and payment details to complete your order. Payment options at Rattan Direct Ltd. Shipping and returns at Rattan Direct Ltd.
Standard UK delivery is free on all orders. Express delivery is available for a fee. If you need to return a product for any reason to Rattan Direct Ltd., simply get in touch with the team to arrange for your items to be collected. Need to contact the team at Rattan Direct Ltd.? Whether you have a question about your order, want to find out more about quality rattan furniture or simply want to know how you could make big savings with Rattan Direct Ltd. vouchers, you can contact the Customer Services department by telephoning 0161 408 0494. Want to discover more from Rattan Direct Ltd.? The company maintains a profile across all your favourite social media platforms. Follow them for lots of entertaining content including competitions, interior design hints and tips, product features and much more. You can also use these pages to find out more about saving money with Rattan Direct Ltd. voucher codes. Don’t forget to check them regularly, as you can never be sure when a free Rattan Direct Ltd. voucher might be waiting for you! Buy now online at www.rattandirect.co.uk. I'd been dreaming of a conservatory for years, but by the time we could finally afford to build one we didn't have much left for furniture! Luckily I discovered a Rattan Direct Ltd. voucher online. I just visited rattandirect.co.uk and entered my Rattan Direct Ltd. voucher codes for a great deal on a full set of conservatory furniture. Now I have the room I always wanted – and it didn't cost a fortune thanks to Rattan Direct Ltd. vouchers. So if you're looking for quality conservatory furniture, see what you could save with a Rattan Direct Ltd. discount code.